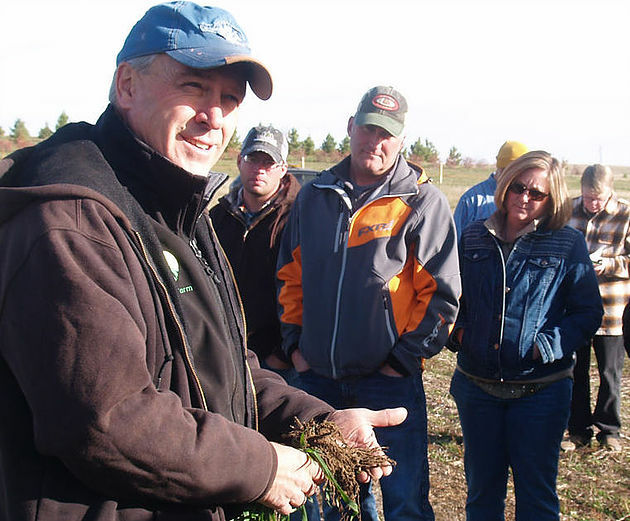 “I used to think cover crops were important, but now I think they are essential,” Fuhrer said. These diverse species of plants had a lot of root exudates, which provided food to the soil food web. Then came long fallow periods, which were in the spring before planting, and another long period of fallow followed after harvest in the fall. “What I tried to do with cover crops was find a fit to fill in the fallow time periods ,” Fuhrer said. There are agronomic and economic reasons to planting cover crops. Keeping a cover on the soil all year long and using a diverse range of plants benefits the soil in numerous ways. Fuhrer brought up a shovelful of soil, and showed where the soil aggregates were. He found the root mass coated with soil aggregates and fastened together with “glue (glomalin)”. Who puts soil aggregates in the soil? The soil food web. What are they going to use as a food source? Green plants produce the food source. “If we’re going to take carbon dioxide out of the atmosphere into the stomata of the plant, this plant, in turn, is going to give off carbon sugars into the soil as the primary food. When you think carbon, always think food. All of sudden, we have all this activity going on right by the root mass,” he said. In a part of the soil Fuhrer had dug up, he pointed to macropores. Who is going to build those macropores? Tap roots (such as radish or sunflower) are one method of building macropores. They are often part of a cover crop mix. “I also have an earthworm here. Why was he here in this root mass? Food. That’s where the food is,” he said. Fuhrer said there was a combination of pore spaces (micropores) and macropores in the soil he had dug up from under the cover crops. “All of a sudden, we have real infiltration and we can begin to build that infiltration,” he said. However, after farming 100 years in the soil, horizontal compaction layers result. Ryan Buetow, NDSU cropping systems specialist, showed a turnip that went horizontal at the compaction layer, before going vertical again. “We know we have some work to do, because here is a compaction layer. You don’t farm something 100 years and not have an impact,” Fuhrer said. Pore spaces are removed by compaction layers (tillage). In the forest or prairie, there won’t be horizontal compaction layers. There will just be root mass. To put the pore space back in, there needs to be a green plant. “You can’t go to WalMart and buy a pore space. You need to have a green plant,” he said. Green plants can harvest CO2 out of the atmosphere, and bring it into the plant. The plant is 42 percent carbon, so it takes a lot of carbon to build a plant below ground and above ground. “We take the grain at harvest, which is one-third of the carbon, but we leave the residue, which is another third of the carbon. The root mass is the other third of the carbon,” Fuhrer said. Sometimes, Fuhrer said he drives by a field, and he sees it has been harvested. “And that’s great. Agriculture is an extraction business: some of this crop will go to energy, some to food, some for livestock feed – but it all goes somewhere,” he said. But in some of those fields, there is little to no residue , left. And that means potential for erosion and lost carbon. What happens when the soil aggregates and fibrous roots are put together? You build soil, and the more soil aggregates and fibrous roots, the better the soil. Soil erosion is not completely laid to rest in 2017 in many areas of the state. Soil and wind erosion, salinity and lack of water quality and lack of diversity are the resource concern areas in North Dakota. “If we continue to plant large acres to low-residue crops like soybeans, even with no-till, what is that going to do to our soil?” he said. Soybean is a great crop, but needs additional soil protection. If soybeans can be planted green, that can work to control soil erosion. This practice refers to no-till planting primary crops into actively growing cover crops. This practice can be used when planting a crop such soybeans into a cover crop. Salinity is a good reason to plant cover crops. Recently, some 65 farmers showed up in one North Dakota town to listen to a salinity workshop – that is how much interest there was in the subject. Rye and barley are good salt-tolerant plants, while alfalfa can be used to harvest out large quantities of water. In the Northern Plains where there are cold, wet springs, with a limited growing season, it is important to plant “green” and a fall rye cover crop plays a part in that. In terms of water quality, that green plant will absorb inorganic nutrients. “Plant green: bring a cover to that land,” he said. Soil organic matter has a carbon to nitrogen ratio. The C:N ratio is important due to the fact that it has a direct impact on residue decomposition and nitrogen cycling in our soils. “If I take a high-carbon plant and I add a low-carbon plant, I have a mid-carbon mixture. I can adjust my carbon to nitrogen ratio that way,” Fuhrer said. As a rule of thumb, the higher the ratio, the longer it takes for the material to decompose, and the smaller the ratio, the more rapidly the plant material will decompose. A mid-carbon plant or mixture, works about right. He explained the C:N ratio of soil is about 10 to 1. Cover crops help because there will usually be more than one crop planted, some with high C:N ratios and some with low. This also opens the window for livestock grazing. Grazing the top half of the plant and trampling the bottom half of the plant to the soil, assures the livestock above and below the soil are on a high plane of nutrition. The majority of the nutrients consumed by the livestock returns to the soil surface. Maintaining body condition of cows is important and cover crops can play a role. The DREC ranch near Manning, N.D., has been doing this for many years, using both grazing corn and cover crops to improve soil and the condition of cattle. Nutrient export is a huge item that everyone will face as agriculture continues in the future. When crops are grown and exported, thousands of pounds of nutrient leave the state every year that never comes back. “That is why I like grazing livestock in the field,” he added. Fuhrer has several combinations of rye as cover crops planted this fall at the Menoken Farm. Next spring, the cover crop will be terminated early if conditions are dry and later if conditions are wet. Cover crops are planted every fall at the farm. “If we are truly going to address salinity, erosion, and lack of diversity in North Dakota, we need to think about introducing cover crops into the system,” Fuhrer said. Soil health principles consist of five principles, which are: soil residues (armor), minimizing soil disturbance, plant diversity, continual live plant/root, and livestock integration. When a cover crop is brought into a field that never had a cover crop, there is going to be an adjustment. Fuhrer suggests farmers start out small at first when trying cover crops.